Invariant natural killer T (iNKT) cells are powerful weapons our body's immune systems count on to fight infection and combat diseases like cancer, multiple sclerosis, and lupus. Finding ways to spark these potent cells into action could lead to more effective cancer treatments and vaccines. While several chemical compounds have shown promise stimulating iNKT cells in mice, their ability to activate human iNKT cells has been limited. 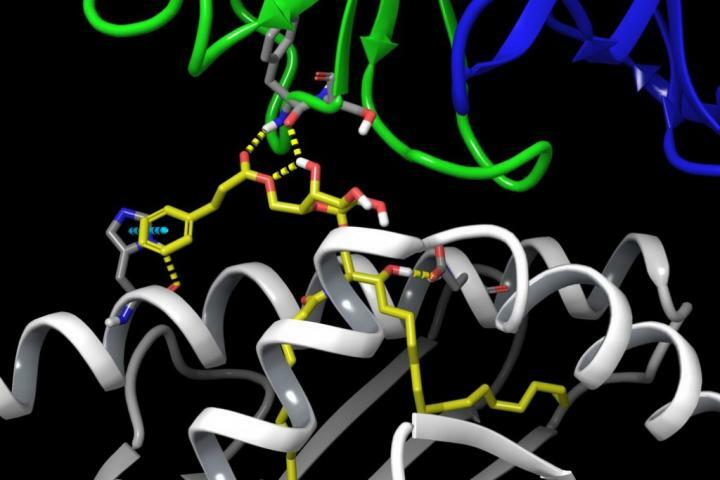 Now, an international team of top immunologists, molecular biologists, and chemists led by University of Connecticut chemistry professor Amy Howell reports in Cell Chemical Biology the creation of a new compound that appears to have the properties researchers have been looking for. The compound – a modified version of an earlier synthesized ligand – is highly effective in activating human iNKT cells. It is also selective – encouraging iNKT cells to release a specific set of proteins known as Th1 cytokines – that stimulate anti-tumor immunity. One of the limitations of earlier compounds was their tendency to cause iNKT cells to release a rush of different cytokines. Some of the cytokines turned the body's immune response on, while others turned it off. The conflicting cytokine activity hampered the compounds' effectiveness. The new compound – called AH10-7 – is uniquely structured so that does not happen. "One of the goals in this field has been to identify compounds that elicit a more biased or selective response from iNKT cells, and we were able to incorporate features in AH10-7 that did that," says Howell, who has been studying the role of glycolipids in modulating the human immune system for more than 20 years. The robust study, years in the making, also applied advanced structural and 3-D computer modeling analysis to identify the underlying basis for the new compound's success. These highly detailed insights into what is happening at the molecular level open up new paths for research and could lead to the development of even more effective compounds. "We synthesized a new compound, demonstrated its effectiveness with biological data, and learned more about its interactions with proteins through X-ray crystallography and computational analysis,'' says UConn associate professor of chemistry José Gascón, a specialist in quantum and molecular mechanics. "We are providing protocols so that other scientists can rationally design related molecules that elicit desired responses from iNKT cells." The molecular analysis helped validate and explain experimental results. "By exposing a crystalized form of the molecular complex to a high-intensity X-ray beam at the Australian Synchrotron, we were able to obtain a detailed 3-D image of the molecular interplay between the invariant natural killer T cell receptor and AH10-7," says corresponding author Jérôme Le Nours, a structural biologist with the Biomedicine Discovery Institute at Monash University in Australia. "This enabled us to identify the structural factors responsible for AH10-7's potency in activating iNKT cells. This valuable insight could lead to the development of even more effective anti-metastatic ligands." Efforts to harness the therapeutic potential of human iNKT cells began 20 years ago with the discovery that natural and synthetic forms of glycolipid ligands known as alpha-galactosylceramides, or α-GalCers for short, were potent activators of iNKT cells. Scientists immediately recognized their possible value in fighting cancer and other diseases. These α-GalCer ligands serve as tiny dock masters in our immune system, helping antigen-presenting cells attract and bind with iNKT cells so they can be activated to kill cancerous cells or fight off pathogens and other foreign invaders. The first promising version of a synthesized α-GalCer was a compound known as KRN7000. While KRN7000 powerfully stimulated iNKT cells in both mice and humans, it triggered the release of a flood of many types of cytokines, limiting its potential for clinical applications. Since then, researchers have been searching for new variations of KRN7000 that maintain their effectiveness in activating human iNKT cells while also favoring release of the powerful tumor fighting Th1 cytokines. In the current study, Howell and colleagues made two significant modifications to an α-GalCer ligand in an attempt to make it more effective. They found that adding a hydrocinnamoyl ester on to the sugar stabilized the ligand and kept it close to the surface of the antigen-presenting cell, thereby enhancing its ability to dock with and stimulate human iNKT cells. In addition, trimming off part of the molecule's sphingoid base appears to initiate the critical Th1 cytokine bias. Both changes, working in tandem, strengthened the effectiveness of the entire molecular complex in terms of activating human iNKT cells, Howell says. To further validate AH10-7's effectiveness, the researchers tested the new compound in wild mice as well as partially "humanized" mice, whose genomes were modified to mimic the human iNKT cell response. Notably, AH10-7 was shown to be at least as effective as KRN7000 in suppressing the growth of melanoma cells in the partially humanized mice. Dr. Steven Porcelli, an immunologist with the Albert Einstein College of Medicine in N.Y., also served as a corresponding author on the study. The research was supported in part by NIH grants U01 GM111849, R01 GM087136, R01 AI45889, and R01 AI 091987.